When I was pregnant with GeorgiaPeach (GP), the Coach and I decided that we aka I would breastfeed our Little Peach. I made him promise me that if I wanted to quit he would remind me of the commitment I made to our family and to stay with it. Sounded simple enough to us. What could possibly go wrong? We took a breastfeeding class. I read books and asked my Circle of Moms who had breastfed successfully and (not so successfully) what I could expect. I was as prepared as I could be. One emergency C-Section later, I was in the breastfeeding business or…so I thought. It was a rough start for me. I was nursing GP on demand as you should but, I didn’t realize she didn’t need to nurse for an unlimited amount of time! 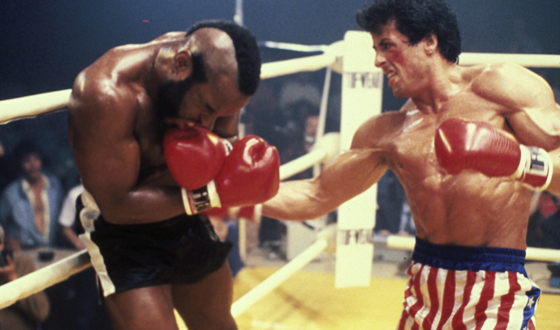 My precious baby was channeling Clubber Lang, kinda like this scene from Rocky III. After going to my corner and spending 3 days feeling like a human pacifier, unlike Rocky, I was ready to throw in the towel. Can I order some formula, please? And that was when all of my ‘I Just Had A Baby And She Depends On Me To Eat’ emotions came to the surface and I broke down. Me (crying): I quit! I’m not breastfeeding anymore. I don’t know what I’m doing. And IT HURTS! Did I miss someone telling me that part? The Coach (very concerned and looking for the slightest symptoms of Postpartum Depression): What happened? Me (still crying): I don’t think GP is getting enough to eat, I am still waiting for my milk “to come in” and I miss my Mom! Listen, before you even start with me, I don’t have PPD so stop looking at me like that, this is normal, I JUST HAD A BABY! And no, I do NOT want to harm myself or our child, okay? I know there are other symptoms but trust me I’m fine, exhausted but, fine. The Coach: Okay. But Babe, you don’t want to quit. You and I both know it. You are doing great, GP is definitely filling up these diapers so she is getting fed. I don’t know what you are feeling but, I will do everything I can to help and support you. Should we call someone? The Coach: Wait. It hurts? Me (exhausted): I don’t know who else to call! I’ve called Jesus, my Friends, the Lactation Consultant from the hospital AND I emailed the instructor from the class. I have one more day left in me and that is it! So…I didn’t quit, my milk ‘came in’ the next morning (the way I found out was pretty hilarious but, I will spare everyone the details) and I successfully breastfed GP for the next 11 months. 🙂 But the point of this entire post is that the I felt slightly bamboozled by the masses. Now, before you go all Lactation Consultant on me, hear me out. As a first time natural “provider” of nourishment to a newborn, I had never (ahem) used my lady parts in such a capacity or as much in a short time span. Know what I mean? Even when you are doing it correctly you will be sore, in the beginning. And I had cooling pads, creams, a nursing pillow, a comfy chair, etc! The whole process took some getting used to and I was reminded that we were both learning what to do. Obviously, a number of women are not able to breastfeed for various reasons so, I get it. You have to do what works for you and YOUR family. Period. Breastfeeding, in the words of Rocky Balboa, “You ain’t so bad”. This sounds so similar to my own experience. Breastfeeding was extremely painful for me for the first 2 months! Mostly the latching on…once she was on, all was good. But I did worry that gritting my teeth and seething the f-word every time I nourished my baby was going to backfire on me. (She is 8 now…so far, so good!). I called everyone: Mom. Doctor. Best friend. Lactation consultant. Local La Leche chapter. Lot’s of advice, but no one seemed to get it. I wasn’t looking for advice. I just wanted someone to listen and let me rage. That’s when I got a call from my college roommate. She commiserated with me and told me how much it sucked (pardon the pun) at the beginning for her too. And she told me that she was so ready to give up multiple times…and then one day, it just didn’t hurt. She told me this happened when her son was 2 months old. So I determined that I would do 2 months. If it still hurt by then, we were done. I figured this was a tangible goal. So, mind over matter, we continued. And I am glad we did. I didn’t need any more advice. I just needed someone to listen and to rage with me. So happy to hear your story! Keep writing! Mind over matter indeed! I am glad you stuck with it. I think we should continue having candid and real conversations with woman about what to expect. It isn’t all roses and rainbows in the beginning. Ugh yeah. It does hurt until you get into the groove and figure it out, sometimes people never do!!! I can totally relate!! I know, right? I just felt like I missed that tiny piece of information. I was so unprepared. Thanks for reading! Nicely said! My let-down hurt for the first couple of weeks with both babies, despite perfect attachment. Thankfully it didn’t stop me feeding either – 17 months with my oldest, 7 months and going strong with my second. Previous Previous post: Don’t You Put That Evil On Us!